The Government’s budget proposal to sharply increase the minimum penalty for traffic offences has drawn both strong criticism and praise from transport sector unions, many of whom claim to have been given insufficient relief in the 2017 Budget. While the Lanka Private Bus Owners’ Association (LPBOA) has already threatened to launch an island-wide strike on Tuesday (15) against the proposal to increase the minimum penalty from Rs.20 to Rs.2500, other transport sector unions have issued mixed messages. 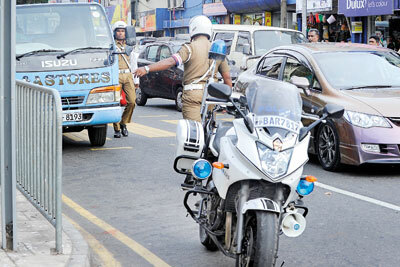 All-Island Schoolchildren Transport Association President Malsri De Silva, while agreeing that the penalty of Rs. 2,500 was too harsh, did not believe a strike was necessary as the proposal was certain to be amended. “During the previous budget there was a proposal to increase the fine up to Rs. 5,000 but we were able to get that proposal removed following discussions with government officials, so I think this too would be amended,” he said. Mr. de Silva stressed his union supported the Government’s proposal to introduce a regulatory mechanism for three-wheelers and school vans and had no problem with compulsory registration of vehicles offering transport service. He also welcomed a proposal to provide an interest subsidy of 75 per cent to upgrade school vans to 32-seater buses. “Frankly, we see many positives with this Budget although the increase in the minimum fine is a cause for concern,” he said. Strong backing for an increase in the minimum fine came from All-Island Three-Wheeler Drivers’ Union President Lalith Dharmasekera. “We actually see it as one of the few positive proposals in the Budget as far as the transport sector is concerned,” he said. For three-wheelers, though, the Budget was a severe setback, he lamented. The price of a three-wheeler was likely to go up by more than Rs. 50,000 due to tax increases while the vehicle was also only being given a 25 per cent leasing facility, he observed. Mr. Dharmasekera claimed most three-wheelers were not being used for hire. “By our calculations, almost 60 per cent of three-wheelers are now being used as personal vehicles, especially outside urban centres. It is the vehicle of the poor man. So that’s who they are going to hit with these proposals,” he said. Discipline on roads had deteriorated significantly, Finance Minister Ravi Karunanayake said in his Budget speech to parliament on Thursday in justification of the fine increase; in 2015 alone, there had been almost 40,000 road accidents causing 2,800 deaths. “At the same time, the scant respect for road rules also results in congestion, which gives rise to significant economic loss to the country,” the Minister said. Sisira Kodagoda, Chairman of the National Council for Road Safety, meanwhile, said those who oppose the increase in the minimum fine were the same ones who flout road rules at will.